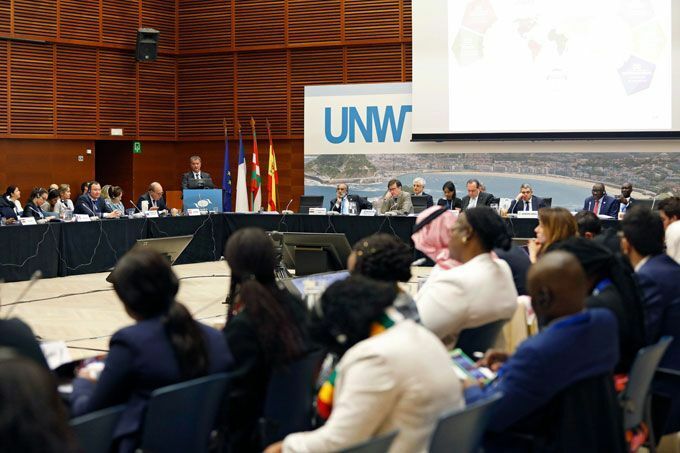 Speaking at the World Tourism Organization (UNWTO) Executive Council in San Sebastian, Spain, today, WTTC President & CEO Gloria Guevara indicated her support for new UNWTO Secretary General, Zurab Pololikashvili and highlighted the importance of public private partnership in the Travel & Tourism sector. Travel & Tourism, which already accounts for 10.4% of GDP and 313 million jobs around the world, is set to grow significantly over the coming years. International arrivals will reach 1.8 billion by 2030 according to UNWTO forecasts and IATA estimates a near doubling of air passengers from 4 billion to 7.8 billion a year over a similar timeframe. Ms Guevara said, “Travel & Tourism is set to grow by 4% a year over the next ten years. It is in all our interests to maximise the opportunities of this growth. WTTC Members are clear that we should focus on three priority areas in order to achieve this. First, security and travel facilitation is fundamental – without people travelling safely and securely there is no tourism. Second, crisis preparedness and management – ensuring our destinations, companies and communities are resilient. Third, sustainable growth – planning for growth to ensure tourism benefits all, taking action on climate change, providing inclusive and sustainable jobs, and making sure we are socially responsible. Technological innovation and the digital agenda will be critical delivering a sustainable future for our sector.